Last Friday, I finally got called down to the courthouse for my first jury summons in 31 years. I took the bus (of course) downtown, arriving at 7:30am as ordered, ready to shuffle slowly through the metal detector with 100 of my fellow citizens. 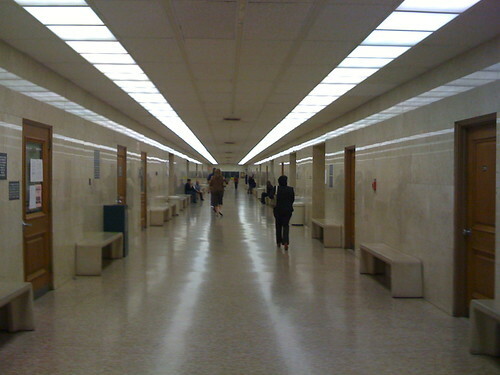 The Stanley Mosk Courthouse is not the worst public building in downtown Los Angeles by any means—one of the architects that worked on it was Paul Williams, who designed plenty of my other faves around town—but it’s not the kind of place you can see yourself being trapped for eight hours a day, debating right vs. wrong. It’s sterile and cold and impersonal. But maybe that’s how justice should be served. After locating my juror room, they made an announcement that anyone not able to stay the full duration of the day needed to go elsewhere to reschedule their service. I had a conflict, so I picked up a pink piece of paper with instructions that directed me to another building around the corner where I’d spend the rest of the morning. 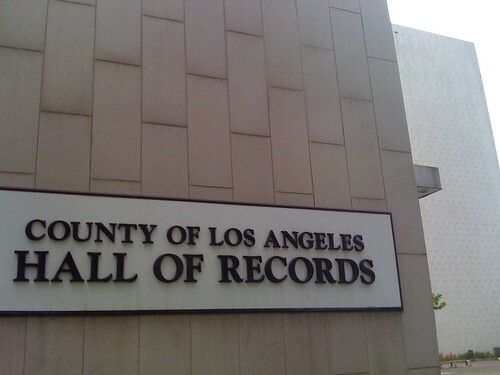 The Hall of Records—besides having a much cooler, law-superhero kind of name—was definitely a far more attractive and interesting building. 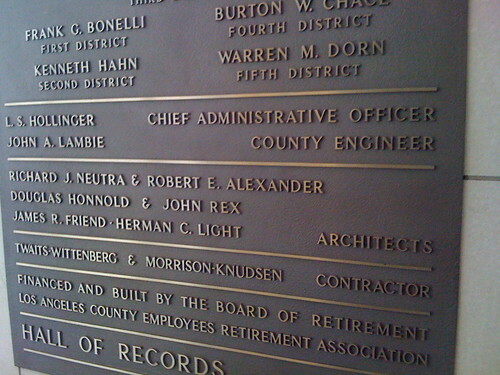 Yes, your honor, I’d much rather perform my civic duties in a Neutra building! This 1962 building designed by the famous modernist was actually built as a warm, more natural response to the frigid corporate towers of the time. It even has some sweet energy-efficient features, like those vertical aluminum fins that run the length of the windows, reflecting glare and creating shade. 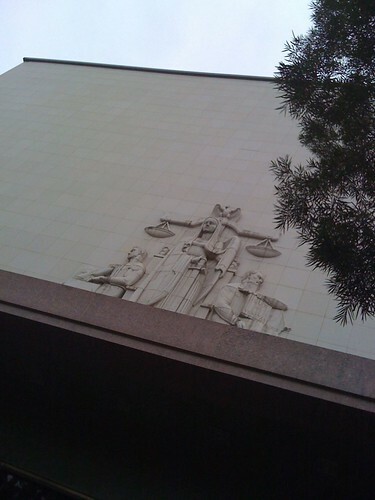 But it turned out that the guarantee of a fair trial does not include the right to good architecture. My service was rescheduled for another day. And when I returned, I’d report once again to the sugar cube down the street. But not before I’d return to this very same corner roughly eight hours later. In a bizarre coincidence (that’s not too odd when you realize that I pretty much always travel along the same public transit routes) I ended up right back here after going to West Hollywood and then coming back downtown to go to another event. 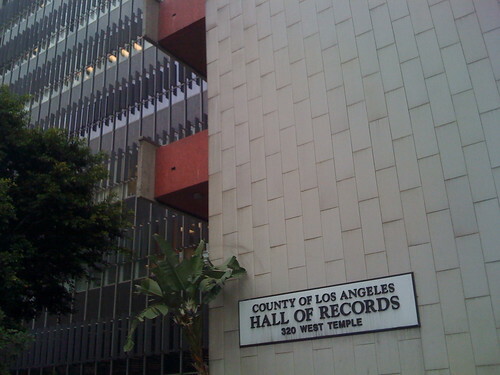 I spent a few minutes recalling the fond moments I’d spent within the Hall of Records. 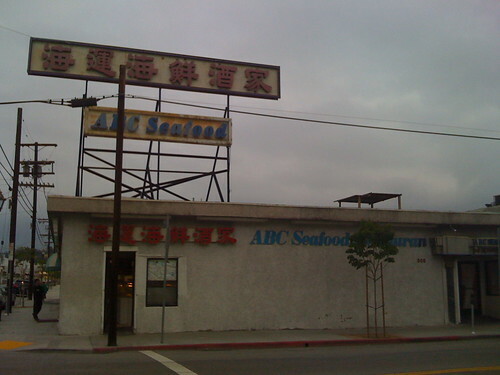 Later, taking the long way home through Chinatown, I paused to document another significant architectural landmark, ABC Seafood. It’s not so much notable for its design as it is for its location. 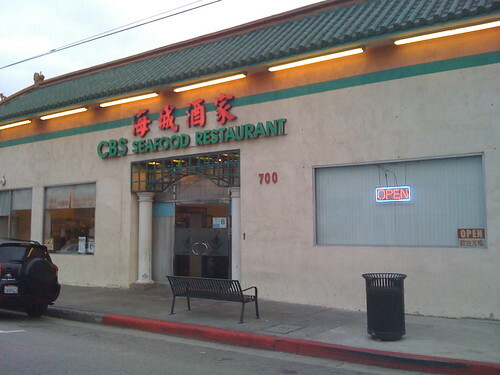 Which is right around the corner from an aptly-named competing seafood network. This entry was posted in building, greening, riding, Street Walker, walking. Bookmark the permalink. As commuters think green, branding and design propels—and sells—public transit. We’ve recently released a new “Green” energy saving technology to emit light from Pole Banners. Flexible lighted displays embedded in their surfaces powered by a small solar panel. We haven’t sent out any Press Releases yet, but I came across your article while searching for Magazine titles.